The art of multi-tabling is a really good skill to have in poker (grinding either cash or Sngs). Multi-tablers generally earn alot more than regular players because the more winnable games you play the higher your profit/hour will be. Every successful online poker player I know multi-tables – Phil Ivey for example (one of the most well-known pro’s) 4-tables Omaha PLO cash games of $200/$400. It’s actually not that uncommon for some enthisiasts to play up to 20 tables at a time! Whether or not you decide to multi-table and reap the rewards of bigger profits however is down to you. In this article I’ll go over some basic tips and guides for multi-tabling. Using great software is really important for multi-tabling 4+ tables. Titan Poker’s software is considered the best for multi-tabling and it allows users to play up to 14 tables at a time. If you download Titan here you’ll also get a great 100% up to $500 bonus to help you grind a bankroll. From my experience as soon as you start making money grinding the tables you should start taking advantage of playing multiple tables. I find that, up to 4-tabling, your profits nearly always increase (in terms of winning bb/hr). Above 4-tabling you might need a bit more experience and skill to play profitably however I definately recommend at least trying it. The reason I think 4-tabling is optimal is that when you play regular cash games (particularly short-handed games) you’ll be out of hands most of the time. This means playing multiple tables isn’t as hard as it sounds, because most of the time you’ll only be concentrating on one or two tables at a time. Unfortunately a well-known disadvantage from multi-tabling is that it reduces the number of pots you can win in each game. This is due to the fact you don’t have the same concentration or information in to play as many hands in each gme. Inevitably the more tables you add to your screen the more TAG you’ll have to play (tight-agressive) however as long as you’re earning more bb/hr overall than you shouldn’t worry about this. From my experience it’s only when you start 8-tabling that your game completely tightens up and you become predictable to opponents (most of whom can tell if you’re multi-tabling by the time-lapses it takes for you to make decisisons). Lastly, a final problem that some pro’s mention about new players multi-tabling is that it slows down your “development”. By adding more tables at the same level rather than moving up the stakes to make the same increase in profit, you’re overall game can suffer. Personally speaking, I’ve noticed tht you’re successfully beating NL25 ($0.10/$0.25) than you’ll make more money and develop much faster moving up to NL50 rather than adding multiple tables. You have to remember that at such low stakes like these the transition to the next level is a big step, and will make you a much better player as you learn to play a higher level. One decision you’ll come across when setting up multi-tabling views is cascading tables vs tiled tables. Cascading tables allow more freedom and ability to pick and focus on certain tables at a time and you can make the more important tables bigger than the others. Tiling them however (the ability to fit up to half a dozen tables onto your desktop without manually moving them) provides an all round view of your games and action. Personally I use the tiling tables for 4-tabling as it provides a more cumbersome view and it also prevents any action being missed accidentally. We’ve all been there when we folded KK on one table because we were too slow to react. 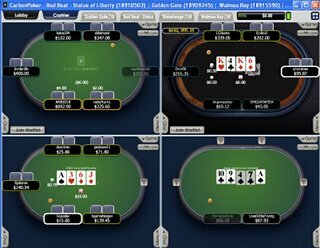 Because multi-tabling can be a fairly dazzling experience it’s always best to make things easier by playing similar stakes games on each screen. If you’re playing one game of $0.25/$0.5 for instance, two games of PLO $2/$4, and one No Limit Holdem $1/$2 game it becomes way too complicated to play across multiple screens at a high level.